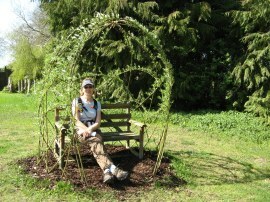 I did this walk with Sara on 9th April 2011. 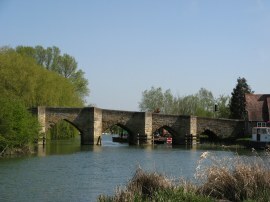 We had spent the night in Witney which made a good base for the various road connections we would be using to get to the start and finish points of the three stages of the Thames Path we were walking over the weekend. 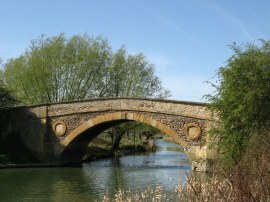 For this walk we first drove down to Swinford Bridge before taking one of the cars over to Radcot Bridge to resume our walk along the path. From Radcot Bridge we joined the riverside path, photo 1, as it heads past the Swan Inn, where there were a few boat moorings, out into open the countryside which would characterise much of this days walk. Not far from the start the path passes Radcot Lock, photo 2, where there were a number of interestingly sculptured bushes besides the locks, photo 3. In fact most of the gardens surrounding the locks we passed today were immaculately kept and the lock keepers clearly take a lot of pride in their surroundings. From the lock the path follows the meanders of the river as it makes its way across grassy meadows, photo 4, although in a number of places the path cut the corners of the loops rather than strictly following every twist and turn. Some of the meadows were being grazed by cattle, a few of which seemed quite interested in our presence, and we spotted a very impressive bull down by the waters edge on the opposite bank, photo 5. Not far below the lock, close to Old man's bridge, the route briefly joins a surfaced farm track where there were a number of cattle crowded into a small area between two cattle grids which we had to carefully negotiate our way through. 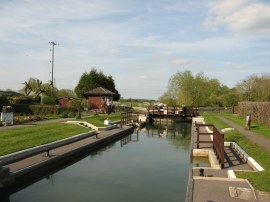 After two miles the route reaches Rushey Lock where the route first crosses over the weir channel before reaching the lock itself. 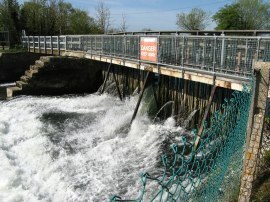 Rushey Weir is one of the last examples of a paddle and rymer weir on the river Thames where the flow of water is controlled by paddles inserted into the gap in the weir using the rymers or handles. 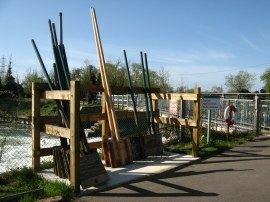 Once over the weir there was a small stack of paddles in an enclosure besides the path, photo 6. As we were heading downstream the river was steadily growing larger and the increased volume of water flow was clearly evident at the weir, photo 7. From the weir the path heads across the gates of Rushey Lock, photo 8, to the opposite bank of the river before joining the access road to the lock. 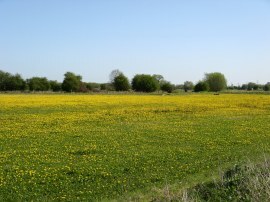 This runs slightly above the surrounding fields, one of which was carpeted in a mass of dandelion flowers, photo 9. 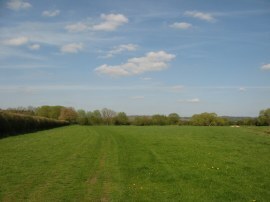 This road is followed to the Buckland Road and Tadpole Bridge, photo 10. Here the route rejoins a riverside path along a more enclosed area of path with tall trees lining much of the opposite bank, photo 11. 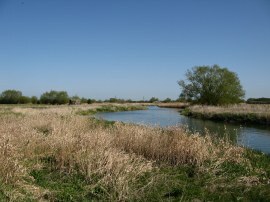 To the left of the path is the Chimney Meadows National Nature Reserve which contains 250 hectares of floodplain flower rich meadows and wet woodland. The route continues by the arched wooden Tenfoot Bridge before heading out into more open land alongside the nature reserve, photo 12. 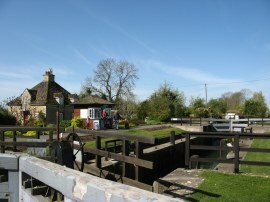 Eventually the route reaches the Shifford Lock cut where the old course of the river heads off to the right and the newer cut, built to aid navigation, continues straight ahead. Reaching another broad wooden footbridge the path crosses over the cut channel before heading to the left through and area of trees which had a large number of various sizes and shapes of nestboxes attached to them. Reaching the end of this wooded area the Thames Path heads to the right to cross over the original course of the river however we detoured a few yards over the weir to the left to visit Shifford Lock, photo 13, where we stopped for a short snack break, sitting on a bench that had a canopy of willow woven around it, photo 14. It was a pleasant place for a break and we watched a boat head through the lock before retracing our steps to cross over the weir and old Thames channel to rejoin the riverside path from where it was a two and half miles to Newbridge. 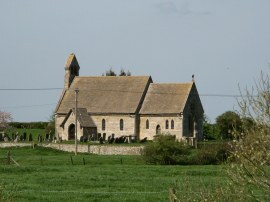 The path was now heading back along the edge of grazing meadows and away to the left we could see the tiny St Mary Chapel at Shifford, photo 15, which was built in 1863. 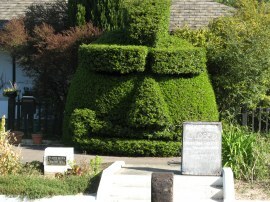 It was more pleasant walking in the sunshine as we steadily made our way to Newbridge. 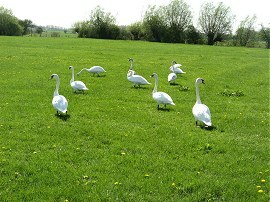 In a couple of places there were large gatherings of swans and greylag geese in the fields besides the river, photo 16. 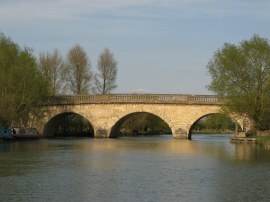 Eventually we reached Newbridge, photo 17, which dates from the 13th century and is constructed with Taynton stone in the same way as Radcot Bridge, which is slightly older. 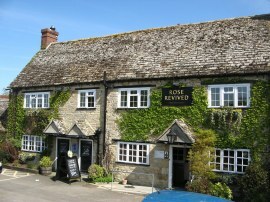 There is a public house at either end of the bridge, The Maybush on the south bank and The Rose Revived, photo 18 on the north bank. 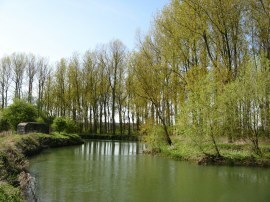 The path heads past the Maybush and crosses over bridge to the opposite bank, the path heading through the beer garden attached to Rose revived before once again heading out alongside fields. 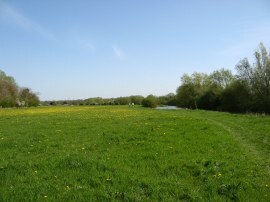 The route heads over a couple of smaller fields and then follows the river round a number of much larger open grassy meadows, photo 19. The path passes another wooden footbridge over the river and a little further on, on the opposite bank, were a few houses spaced out along the river bank, some very attractive, other rather less appealing. At one point a dog came running across the top of the meadow at high speed and disappeared through a gap in the hedge, looking rather lost, although later we did see it with its owner. Reaching Northmoor Lock, photo 20, which by my counting is the seventh lock we have passed so far, we stopped for our lunch break on a handily placed wooden bench. 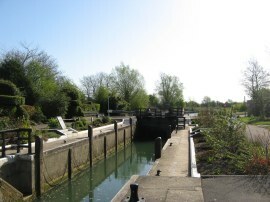 The weir is just the other side of the lock island and is the only other remaining complete paddle and rymer manually operated weirs on the river. 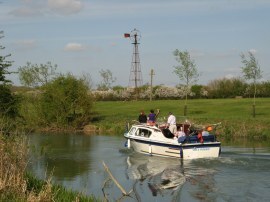 From the lock it is then a further mile alongside the river, photo 21, to reach Bablock Hythe. Bablock Hythe was the site of an old ferry crossing where the towpath changed banks however the ferry no longer operates and there is no bridge and thus the Thames Path has to divert away from the river for a while. 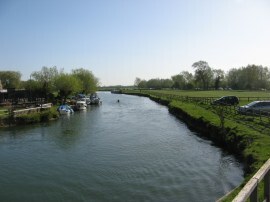 From the Ferry Inn on the banks of the river the route heads to the left along a tarmac path that runs past a static caravan site to reach a road junction where the route continues straight ahead. Just under half a mile from the river the route joins a footpath on the right that runs along the left hand edge of a number of fields which were being grazed by sheep when we were walking through. While we were on this stretch of path we spotted a number of muntjac deer running back and forth by the hedge at the bottom of the field although they very soon blended in with the undergrowth. Reaching a hedge lined farm track the route heads to the right for a short distance before joining another footpath on the left where the track ends. This is followed along the edge of one field, photo 22, and then diagonally across the next two fields to rejoin the river Thames, just under two miles from where we had left it. On the opposite bank of the river was the large Farmoor Reservoir and although this remained hidden from view behind its retaining wall we were able to spot the tops of some sailing boat masts from the path. 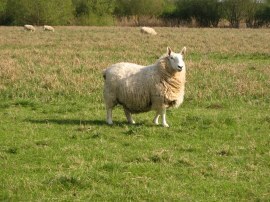 It was then back alongside the river Thames through pastures being grazed by a variety of different sheep, not that I have any idea what type the sheep in photo 23 is. Cutting the corner of one last meander, the path headed over to cross Pinkhill Weir where we spotted a fish ladder built into the structure before heading across the small wooded lock island to Pinkhill Lock, photo 24. 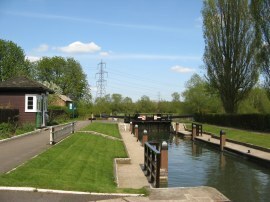 The path crosses over the lock gates and continues down the south bank for a short distance towards some houses. Here the route has to leave the river bank and takes a brief diversion along a fence lined footpath that leads up to the B4044 Oxford Road. 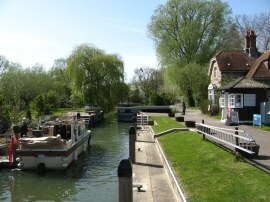 The Thames Path then heads to the left along the road for a few yards before heading to the left down the driveway of boatyard of Oxford Cruisers to rejoin the river Thames. 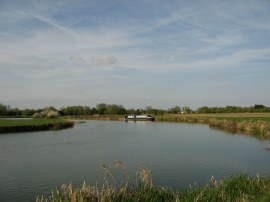 The small marina was packed with canal boats and there were a number of other boats out of the water for repair and maintenance, one of which was rather obscuring the route back to the footpath. 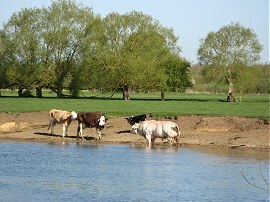 Back besides the river, photo 25, it was only a short walk on to Swinford Bridge. 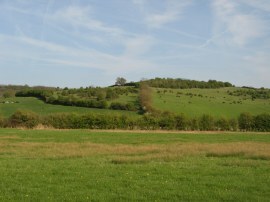 Away to the left of the path was the high ground around Cumnor and Wytham Hill, the first proper hill we had seen besides the path since the start of the walk, photo 26. 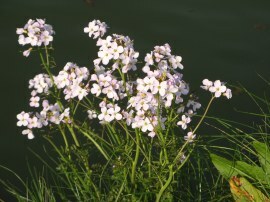 For much of the day the banks had been lined with the small pink flower in photo 27 which I think is Cuckoo Flower, I'm sure someone will correct me if I'm wrong! Reaching Swinford Bridge, photo 28, we left the Thames Path for the day, heading up a path to cross the road bridge over the river. 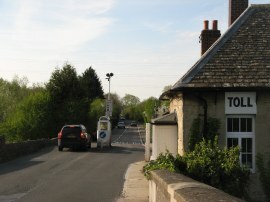 Swinford is one of the two remaining toll bridges over the river Thames and we passed the small toll both in the middle of the road, photo 29, where the 5p charge to cross the bridge is collected. The small car park we parked in is just behind the house and was £2 for the days parking, payable at the toll booth. Arriving back at the car we had walked another 18 miles along the Thames path. The sun had shone brightly all day although there had been a breeze at times which kept the worst of the heat away. I did however end up with a small patch of sunburn on my right elbow and my neck was a little red too. I still can't believe how warm the weather was for early April this year and certainly wasn't expecting to get sunburnt when I set out. It was only three years ago when I had to abandon a planned early April walk along the North Downs Way because of snow. 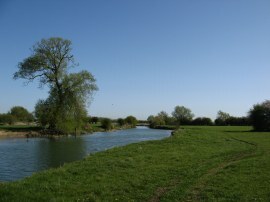 As usual I have uploaded the route of the walk which can be accessed here: Thames Path Stage 4 Route.